Kaila joined Bay State Salem in July 2016. 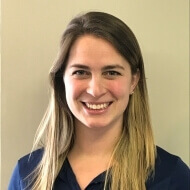 Kaila attended Northeastern University where she received her bachelor’s in Rehabilitation Science in 2015, followed by her Doctor of Physical Therapy in 2016. Kaila specializes in treating patients with a wide variety of orthopedic conditions of both the spine and extremities. Kaila incorporates a variety of treatment styles into her approach in order to maximize her patient’s recovery and prevent further injuries. She believes in not only addressing the symptoms, but the cause of the symptoms and a focus on prevention of future injuries. Kaila always wanted to pursue a career in which she was able to help others. She chose the path of Physical Therapy after meeting the physical therapist for the Boston Ballet at her dance studio when she was 14. In her spare time Kaila continues to dances with the company DanceWorks Boston. She also enjoys rock climbing, skiing, hiking, and soccer. Kaila values spending time with her friends and family, especially her young niece and nephew. Kaila works in the Salem clinic Monday through Thursday.